A present so deliciously thoughtful I'd add it to my "gifts to give" board in a heartbeat! 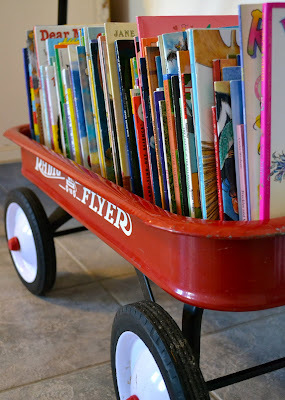 As a beloved instructor, our girlfriend received a red wagon full of children's books from her students to begin her baby's library. Each book is filled with majestic colors, animated titles, slick pages and an inscriptions of well-wishes one might not suspect a middle school child capable of leaving. It's a beautiful reminder of all that's good in the world. Just like the little angel born today. May the wagon of love be the best journey yet for this amazing family!